Choices are the hinges of destiny - Gateway to Canada | Canada Immigration Consultancy! When we opended our office at Mall of Asia in Pasay City last year, Ms. Rizza Nandwani was one of the first clients who chanced upon our office there, walked-in to inquire and decided right there and then to start with her application. She is a Certified Public Accountant and during that time, Accountants are still included in the priority list. It is currentlt not included in the 29 In-Demand Occupations. It took a while before her application was filed to Centralized Intake Office (CIO) because according to her, she wasn't in a hurry. 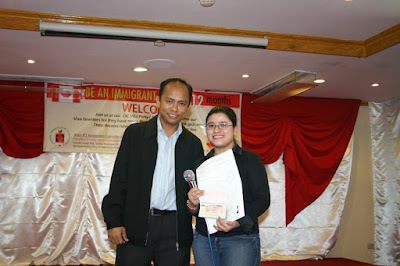 But because we constantly remind her of the possibility of changes in the immigration regulations that may affect her application, her application was fortunately sent to CIO before the June 26, 2010 Ministerial Instruction. Shortly after that, she finally got her visa and was one of those who was there at the immigrant's visa party last Saturday. If you are eligible under the current regulations, start your application now! Choices are the hinges of destiny.